This is typical of some of the Cycle Tracks you will meet on the Continent, particularly the Netherlands, Germany, France and neighbouring countries. It was created from a disused railway line that ran for about 12 miles between Annecy, in North East France, and the nearby town of Faverges. 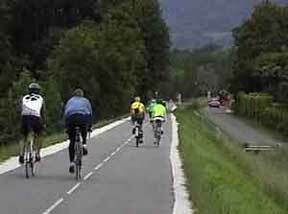 It is used both for Leisure and also for Commuting - where the track provides a faster link between the towns than using the main road. 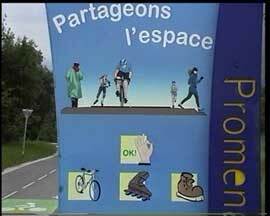 Keen cyclists use it to access the interesting countryside nearby, others use it for jogging or roller blading. At weekends it can be quite busy with people out on a family walk with pushchairs and children on junior cycles, yet all get along amicably together. Where the track crosses major roads then crossing points are provided. Where it crosses minor roads the Cycle Track takes precedence and motorists always stop to allow Track users to cross first - perhaps French Law has something to do with this. Here are some pictures, regrettably taken on a rather dull afternoon when few people are about, they give no indication of the popularity of this route. 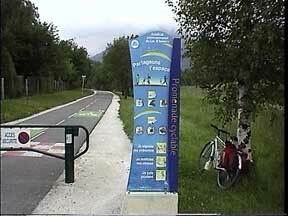 than-that of the minor road alongside.----------------------------but do not stop cyclists etc on the trail. -------------These are the people who can use the trail.-----The Tunnels are lit, the adjacent rock face is used for climbing. 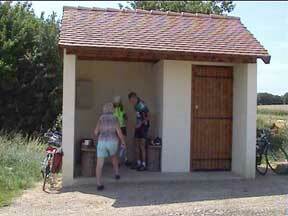 and here is a Cyclists' Refuge in Burgundy with seats, toilet and water supply. 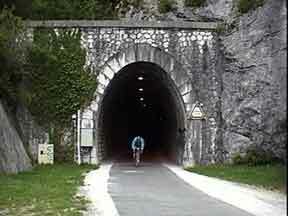 One very popular Cycle Route is from Regensburg to Vienna. You can see someone's trip by clicking here. Broadband required. then a good starting place for information is the Cyclists Touring Club. 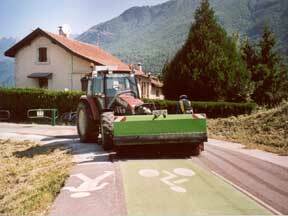 To see a Dutch approach to cycling see here.